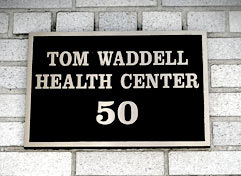 The Transgender Clinic of the Tom Waddell Health Center is committed to providing quality, integrated health care in an atmosphere of trust and respect. Anyone who identifies as transgender can be seen in our clinic: male-to-female, female-to-male, intersex, and those in-between. We are a multidisciplinary primary care clinic, which means we treat all of your medical issues (not just issues related to gender), we have mental health and social services, and we work closely with community organizations. Tuesday afternoons, 1:30 p.m. – 5:00 p.m.
Our intake process is still in the works but please call the TG voicemail line at 415-355-7588. Monday through Friday, 8:00 a.m. – 6:00 p.m.
San Francisco Department of Public Health.